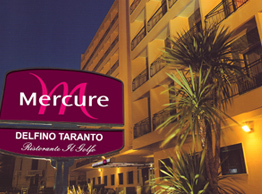 Mercure Delfino Taranto: the greatest hotel in Taranto. Positioned on the suggestive waterfront of Taranto and easily reachable from the principal arteries of communication, Mercure Delfino Taranto is the ideal place for job sojourn or amusement. In its ample and refined spaces, entirely restructured in August 2007, the guests of the hotel can enjoy of the free inside parking, of the corner-bar and in summer time of the swimming pool and of the terrace of the gulf. People on a business trip, can use the wi-fi net and their reserved rooms. The inside restaurant, the famous congressional structure and the courtesy of the team, make the Grand Hotel Defino a hotel of international prestige.